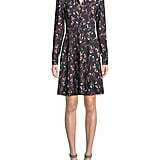 Pippa Middleton has let this Kate Spade New York dress (which is on sale for $209, by the way) peek out from two Winter coats now. Needless to say, we're smitten. When she was pregnant, Pippa sported the design underneath an ink blue jacket with white sneakers, but she totally dressed it up for a night out with husband James Matthews in London. The two attended a charity carol service at St. Luke's Church, and Pippa added an oxblood topper with a furry collar, tights, an Aspinal of London saddle bag, and suede pumps. 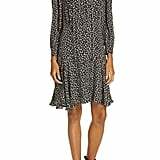 Did we mention this dress also has a fox print on it? In our opinion, that's way cooler than your standard leopard. If you like the idea of a breezy piece that will work for numerous occasions and also features a unique animal pattern, you can pick up Pippa's exact number, or shop for some similar options we know you'll fall in love with.